On Public Safety – when clogged storm drain inlets, culverts and other blocked drainage paths result in street flooding, hazardous driving conditions and property damage. On the Environment – when these pollutants are allowed to reach creeks and other waterways at levels toxic to fish and other wildlife or otherwise reduce water quality locally or downstream. 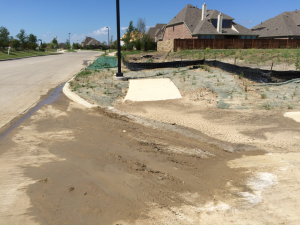 Following these stormwater pollution prevention guidelines for construction related activities will help you comply with Town of Prosper requirements as well as other applicable state and federal regulations. Sand, dirt and similar materials should be contained and stored at least 10 feet from catch basins or storm drains. 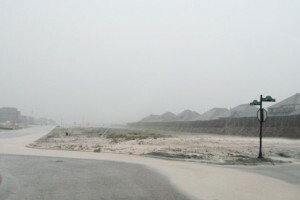 Containment or stock piles should be covered with a tarp when rain or high winds is forecast. Use (but don’t overuse) water for dust control. Sweep streets and other paved areas daily. Do not wash down with water! Cover and check dumpsters regularly for leaks and to make sure they don’t overflow. Repair or replace leaking dumpsters promptly. Keep an adequate supply of spill cleanup materials (rags, absorbents, etc.) available at all times. When spills or leaks occur, surround, contain and remove them immediately, being particularly careful to prevent them from reaching the gutter, street or storm drains. Never wash spilled material into a gutter, street, storm drain, or creek! Place spill kits in accessible locations near the main waste transfer areas and loading docks. Train all employees on the proper use of these kits and proper disposal of used absorbents. Reportable quantity spills of any hazardous material must be addressed immediately! Call the Prosper Fire Department (911) and/or the Town of Prosper Public Works at (972) 347-9969 for assistance. Caution! Never block storm drains or drainage paths! Inspect vehicles and equipment for leaks frequently. Use drip pans to catch leaks until repairs are made and repair leaks promptly. Perform on-site fueling in a bermed area or over a drip pan big enough to prevent runoff. If you must clean vehicles or equipment on-site, clean with water only in a bermed area and divert rinse water away from gutters, streets, storm drains or creeks. Do not use soaps, solvents, degreasers, steam cleaning equipment, etc. unless this wastewater is captured and treated on-site or properly disposed. Place spill kits in accessible locations near storage/maintenance areas containing oil. Place covers over any sanitary sewer drains near oil storage or waste transport areas and divert any rainwater away from these areas. Protect but never completely block any storm drains. Provide secondary containment for aboveground storage tanks (single-walled in a fluid tight box or double-walled properly identified). Label with tank contents, keep lids and valves secure and tamper proof at all times. Do not store oil or other chemicals near storm drains or drainage paths. Always protect storm drain inlets and manholes when paving or applying seal coat, tack coat, slurry seal or fog seal. Place drip pans or absorbent material under paving equipment when not in use. Protect gutters, ditches and drainage courses with effective controls (straw wattles, sandbags, earthen berms, etc). Provide filtration and overflow to prevent flooding of streets. Check all controls before and after heavy rain events. Do not use water to wash down fresh asphalt or concrete pavement. Store concrete grout and mortar under cover and away from drainage areas. These materials must never reach a storm drain. Wash concrete equipment/trucks at an appropriate off-site location or designate an on-site area for washout (water must be contained). Wash water can never reach the street, storm drain or fresh water sources such as creeks or streams. Prevent rain water from reaching fresh concrete wash out areas. Keep excavated soil on the site where it is least likely to collect in the street. Transfer to dump trucks on the site, not in the street. Use straw wattles, silt fences or other control measures to prevent the flow of silt off the site. Controls must be effective and maintained. Never schedule earth-moving activities when rain is forecast. If grading activities must be conducted during wet weather, implement effective control measures to prevent erosion. Mature vegetation is the best form of erosion control. Minimize physical disturbance and chemical damage to existing vegetation especially on site perimeters. If you disturb a slope during construction, prevent erosion by securing the soil (use erosion control fabric, seed with fast-growing grasses, etc.) as soon as possible. Place effective controls down-slope until soil is secure. Never rinse paint brushes or materials onto the ground or in a gutter or street! Paint out excess water-based paint before rinsing brushes, rollers or containers in a bucket rather than using a sink. Allow solids in wash water to settle in bucket and separate for proper disposal. Reduce wash water volume with evaporation whenever possible. Paint out excess oil-based paint before cleaning brushes in thinner. Filter paint thinners and solvents for reuse whenever possible. Dispose of oil-based paint sludge/unusable thinner as hazardous waste. For further waste disposal information contact the Town of Prosper at (972) 347-9969. Always effectively contain saw cut slurry in immediate area to be cut and protect storm drain inlets until all waste is recovered. Use filter fabric, straw wattles, sandbags, gravel dams or other effective controls to keep slurry out of the storm drain system. Protect but never completely block any storm drains. Shovel, absorb, or vacuum saw-cut slurry as you and before it dries! Pick up all waste as soon as you are finished in an area and sweep thoroughly at the end of each workday. If saw cut slurry enters a catch basin, recover it immediately. Reuse water for dust control, irrigation, etc. to the greatest extent possible. Be sure to call Town of Prosper at (972) 347-9969 before discharging water to a street, gutter or storm drain. Filtration or diversion through a basin, tank or sediment trap may be required.